What's the old cliche? Out of pain and suffering is all great art born. Well, if so, Hissing Fauna, Are You The Destroyer? is a textbook example. For ten years since their emergence from the Athens, Georgia-based Elephant 6 Collective in 1997, leader Kevin Barnes and his performing outfit Of Montreal had been delivering all manner of bright, joyous indie-pop, usually focusing on humorous, Kinksian third person or alter ego character studies. 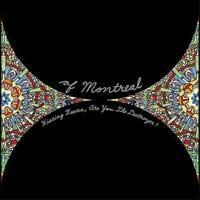 Personal confession was not part a big part of the Of Montreal equation. But then in the mid-aughts, around the successful release of 2005's celebratory The Sundlandic Twins, Barnes went through a very dark period. Having recently moved with his new wife Nina to her native Norway for the birth of their child, he soon found himself overwhelmed by new responsibilities and a growing sense of cultural isolation, fell into a deep, deep depression, had a nervous breakdown, and before you know it, was back in the states, separated from his wife, locked in his apartment with his laptop and his Pro Tools, embittered, and ready to wallow and rage. And man, oh, man, wallow and rage he does. Diving head first into his personal dilemma, he puts the whole experience out there, his grievances (Suffer For Fashion ), his desperate, drug-laden grasps for help (Helmdalsgate Like A Promethean Curse ), the breakdown (The Past Is A Grotesque Animal ), even post separation dalliances (Bunny Ain't No Kind Of Rider , Faberge Falls For Shuggie ). And yet, no matter how dark the lyrical subject matter gets, the music is never less than fully appealing. Rather than try to match the music to his dark moods, Barnes instead aims to match it to his sense of personal chaos. A hyperactive talent to begin with, prone to trying to fit more musical ideas into a single track than most artists strive to on an entire album, Barnes goes full-on berserk here...combining his already patented, demented spins on Beatlesque and Bowie-ish harmonies with a new found love for Prince at his funkiest and some of the most stunning pastiche transitions heard since Beck's Odelay . The approach works brilliantly, allowing Barnes to instrumentally mirror his bummer lyrics without producing bummer songs. Musically, many of the album's tracks (especially the most Prince-like number, A Sentence Of Sorts In Kongsvinger) take on an almost joyous, counterpointed feel, and while not every one of its sometimes jarring change-ups work, the overall hit-to-miss ratio is staggeringly high, making Hissing Fauna one of the most vibrantly alive albums of the 2000s. The album is also flawlessly structured, broken into three main segments and well-earned coda that follow each other with a clear narrative and emotional logic. The opening six tracks hit like an emotional blitzkrieg, all flailing and desperation and woe and over in a scrambled flash. Then the album literally grinds to a halt for the stunning nervous breakdown simulation The Past Is A Grotesque Animal . No verse, no chorus, just eleven and a half minutes of self-disgusted ranting set to an unnerving, shoulder-tensing synth groove and taunting, off-kilter, Sympathy For The Devil -styled backing vocals. You can read more about this in my Favorite Tracks Of 2007 post, as I consider it not only the best song of 2007, but one of the greatest tracks of the decade, but suffice it to say here the song couldn't be better positioned within the album as a whole. Following that emotional whirlwind, the songs go external, as Barnes breaks free of his emotional paralysis and recounts lashing back at his wife sexually and even fantasizes about striking back physically (She's A Rejecter ), and then suddenly, out of all that anger, comes, as in real life, a happy ending. Barnes and Nina reconcile, and the sense of recalibrated equilibrium is perfectly captured in the odd, serene We Were Born The Mutants Again With Leafling . In a music year that produced some serious heavyweight releases, from Radiohead's gorgeous, self-distributed In Rainbows , to LCD Soundsystem's genre-defining dance rock masterpiece Sound of Silver , to M.I.A. 's zeitgeist-capturing, world beat manifesto Kala , Hissing Fauna just cut a little deeper, raged a little harder, and ultimately stood a little taller. It goes down in my book as the best rock album of 2007. This post is dedicated to my good friend and co-worker Scott Stanton, who loved Of Montreal and cherished this album heart and soul, and sadly passed away in a tragic, rain-induced car accident the morning of December 18th, 2010 in Los Angeles. Cherry Picker's Best Bets: Suffer For Fashion , A Sentence Of Sorts In Kongsvinger , The Past Is A Grotesque Animal , Bunny Ain't No Kind Of Rider , We Were Born The Mutants Again With Leafling . Here's the video for one of the album's funkiest and calmest moments, Gronlandic Edit, which incorporates the distinct artwork that the band has utilized since its beginnings in 1997. What are your thoughts on Hissing Fauna? Please share in the comments section below.